With just days until the Broncos and Panthers lock horns for Superbowl 50, Microsoft has given us a glimpse of what it could be like to watch the fight for the Vince Lombardi trophy using HoloLens. The ambitious holographic, mixed reality headset feels like it's still some way from entering our homes, but the Redmond company continues to tease us with ways we might one day use it. In the short concept video, which you can see below, Microsoft explores a host of scenarios including multiple HoloLens users taking in the action. In another scene, one HoloLens owner performs a simple hand gesture to bring up a full scale model of the Levi's Stadium, home to the San Francisco 49ers. Why would anyone do that mid-game? Who knows. More interestingly, another scene shows how fantasy football stats could be effortlessly integrated into the action in real time. 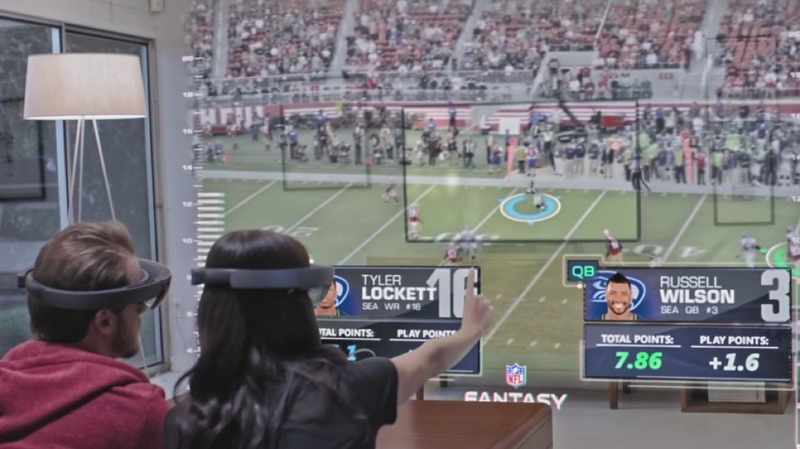 While two supporters zoom closer into the on-field action on a coffee table as a full sized football player hologram pops up in the corner of the room tossing a perfect spiral. It all sounds pretty impressive, but as we've already mentioned, this is a concept of how HoloLens could work. And let's be fair, the end benefits don't really sound that exciting. The current state of play with Microsoft's headset is that the developer edition will be shipping in the first quarter of this year priced at a staggering $3,000. While there's no concrete details on when we'll see a consumer version, we are beginning to get a better idea of what to expect from the first-gen model. Bruce Harris, a Microsoft "Technical Evangelist", recently revealed what we can expect in terms of battery life, the potential of using multiple headsets and the all important field of view. This is isn't of course the first time Microsoft and the NFL have teamed up. The company's Surface tablets have been making an appearance pitch side for coaches to review plays and tactics. Here's hoping we're not waiting too long for this exciting tech tie-up.